ARRA News Service: What The Economy Needs Now . . .
What The Economy Needs Now . . .
. . . Stimulation of growth through a corporate tax-rate cut! by Stephen Moore and Larry Kudlow and Arthur Laffer: Everyone’s blaming the oil price collapse and China’s sliding economy, for the rout of the stock market these first two weeks of 2016. That’s part of the story, but there may also be a policy explanation for the bearish sell-off. Call it the Bernie Sanders effect. In the Democratic presidential primary debate last week between Hillary and Bernie, the race was on to see which could raise taxes and punish businesses more. While Hillary was touting her income tax surcharge on millionaires that could raise income taxes to near 50 percent (and her capital gains tax hike), Sen. Sanders said that a 90 percent tax rate might be too high, but somewhere approaching that number is the target he’d shoot for. Bernie also talks about breaking up the banks, putting Wall Streeters in jail, a single-payer health care plan to the left of Obamacare, and adding trillions of new government spending. This isn’t blossoming investor confidence. Was it just coincidence that polls that show Bernie surging into a widening lead against Hillary in New Hampshire and even beating several Republicans in a head-to-head competition were released the same day the stock market took another nose dive. But for the umpteenth time: Where is the Republican growth message? The economy is sputtering clearly with corporate profits and business investment weakening and consumer spending slowing down as well. The GOP runs the House and Senate, but still no sign of a growth package to offer up a contrasting vision from the Bernie and Hillary show. Too many in the GOP have bought into the Chamber of Commerce unwise idea that funding the Export-Import Bank is a stimulus. If the economy does sink into negative territory this year, the Democrats will surely demand more infrastructure spending, unemployment assistance, job training and a panoply of “stimulus” budget busters that didn’t work in 2009 and won’t work now. The Republican response to this nonsense should be short and sweet: been there. Done that. What could be done right now to stimulate growth, investment and investor confidence almost immediately? The answer is a business tax rate reduction. Pass a rate cut to 15 percent, with full capital expensing and a 5 percent voluntary repatriation tax on the $2 trillion owned by U.S. multinational firms that is parked abroad to avoid the high corporate tax. This won’t cost the Treasury much in lost revenues, and who knows? It may raise money over five years through the money and businesses repatriated back to America. Apple and GE might bring back tens of billions of dollars for assembly plants and research centers on these shores. 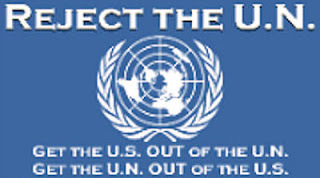 The current U.S. rate of 35 percent (federal) is the highest of all the nations we compete with. The rest of the world is at a rate closer to 25 percent with some nations like Ireland as low as 12.5 percent. Let’s go from the highest rate in the world to one of the lowest and see what happens to capital flows. We know the 35 percent rate is an economic Get Out of Town and Do Not Stop at Go card. We have seen companies like Burger King, Medtronics. Pfizer, and dozens more leave the United States. In search of lower tax rates. More companies will scamper out if this isn’t fixed — and they take jobs with them. 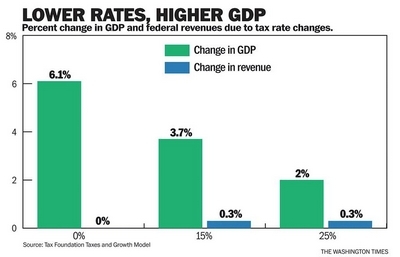 Liberals like to pretend that the U.S. tax rates aren’t chasing out businesses and jobs, but then why are all the nations we compete with slashing their rates. The international average has come down from almost 40 percent in 1990 to 25 percent today. For two and a half decades the U.S. rates haven’t budged, while the rest of the world keeps chopping. We’re like a 6th grader who stops growing and then goes out and tries to play competitive basketball with 20 year olds over six feet tall. Study after study tells us that the corporate tax at 35 percent is a loser. The American Enterprise Institute has found that wages rise much slower, if at all, in nations with high corporate tax rates. This happens because of less investment in the high tax nations, which means lower paying jobs. In other words, it’s not rich fat cat shareholders, but working class Americans who suffer the most. As for the stimulus value of our proposed business tax cut, the Tax Foundation finds that immediate expensing and cutting the business tax rate are the best short-term strategy for generating more growth. Here is how the Foundation put it: “A cut in the corporate tax rate would have large effects on GDP, but minimal effects on federal revenue in the long run.” Nothing else has this kind of big bang for the buck payoff. By the way, for those Keynesians out there stuck on the demand side, tax rebates and credits, produce almost no positive feedback. Republicans are preparing their budget plan this week. They should use a process that President Reagan used called Reconciliation to make room for a corporate tax cut jobs stimulus. This means the Republicans in the Senate will need only 51 votes to pass it once the House does so by a wide margin. We can imagine several Democrats in red states joining the GOP for this growth stimulus. If Mr. Obama vetoes such a bill, austerity Democrats will pay a high price in November. We’re all for a sweeping tax reform in 2017 and perhaps a flat tax with a Republican president in office. But it’s time for a tax cut down payment. Cut the corporate tax now. Stephen Moore, Larry Kudlow and Arthur Laffer are cochairmen of the Committee to Unleash Prosperity. Mr. Moore is a Distinguished Visiting Fellow, Project for Economic Growth, at The Heritage Foundation and is also an economic consultant with Freedom Works which shared this article previously published at the Washington Times. Tags: Stephen Moore, Larry Kudlow, Arthur Laffer, Economy Needs, stimulation, corporate tax-rate cut To share or post to your site, click on "Post Link". Please mention / link to the ARRA News Service. and "Like" Facebook Page - Thanks!